When you think of Thailand, what comes to mind is friendly people, good weather and great cuisine, but you might not readily associate the country with wine. Well, despite what may be viewed by some as limiting government legislation, the wine industry is well established in Thailand with a number of quality vineyards producing some fine wines. The range of vineyards is diverse and opportunities are provided for groups to participate or observe the various winemaking processes and make for a perfect, and different pre or post conference leisure activity, or team building exercise. If you are contemplating making a business trip to Thailand, then it is well worth making a journey to see and sample some of what are called New Lattitude Wines. These have started to attract the attention of wine connoisseurs and more importantly, have taken a larger portion of the market share. One of the pioneers of the Thai wine industry has been Monsoon Valley Wines made from the Hua Hin Hills Vineyard. This is owned by Siam Winery, South East Asia’s top winery. The line includes Sangiovese, Colombard and Shiraz and other varieties many of which have received accolades and awards at international wine tastings. 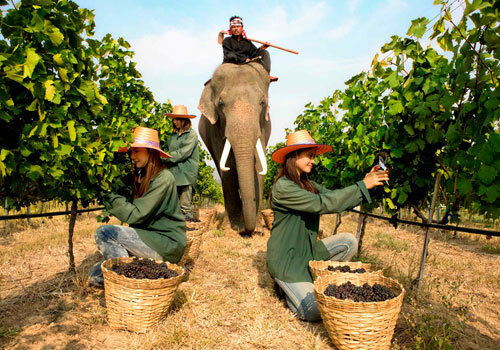 The Khun Malee Vineyard is located in Saraburi province and is just a two hour drive from Bangkok. Occupying an area of 96,000 square metres, it nestles on a hill and is ideal size for walking around. Visitors are encouraged to sample the wine from more than 10,000 wines and watch the production process. A highlight is said to be the real grape toffee and which is claimed to be exclusive to the vineyard. Also in Saraburi are the Muaklek District Vineyards. These are open all year round to visitors. You can sample fresh grapes and other grape products including seedless grapes, wine, grape juice, grape candy, grape jam and more. Close to Bangkok and only a short drive away from Khao Yai National Park is Granmonte, arguably the most well-known of Thailand’s vineyards. The Pak Chong District in Nakhon Ratchasima is the location of the attractive Rattana Thong Chai Grape Garden. This covers 80 rai (2.52 rai in one acre) and has a surprising focus on premium foreign grape species, both seeded and seedless. This is quite an achievement as foreign grapes are usually difficult to grow and produce. The Thong Chai Grape Garden is open daily. Also in Nakhon Ratchasima is the Pak Chong Grape Farm. This is another farm of foreign seedless grapes with a winery of premium, but regarded as inexpensive quality wines from Khao Yai. The land area of 2,000 rai is divided between wine making and fresh grapes. The Supattra Vineyard also situated in Nakhon Ratchasima province encompasses 50 rai and has a division between seedless grapes growing plots and plots for fresh table grapes and other processed products. These items include grape pie, grape ice cream and grape juice. The rotation of five grape varieties are grown all year round. The vineyard is set among an impressive landscape of mountain ranges and there are ATVs available for rent to journey around the vineyard. Head north and in the province of Loei, you will find Chateau de Loei which is regarded as another of Thailand’s wine industry founders. It offers tours, tastings and short stays. 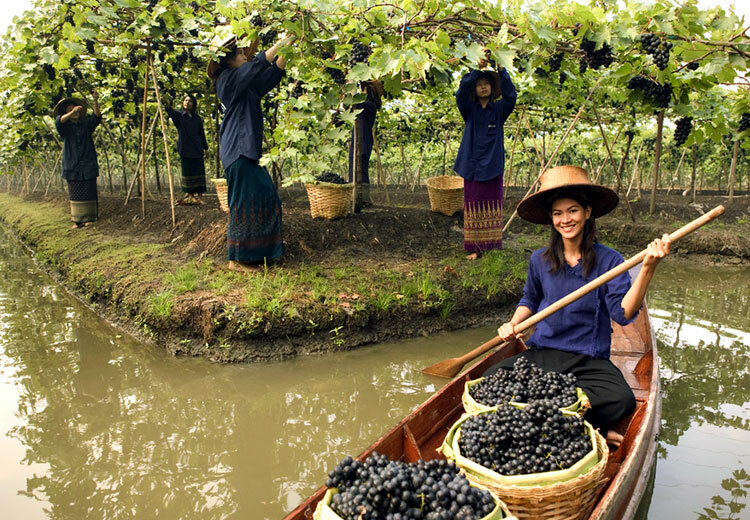 The future for the industry looks bright as the wines age and the winemakers themselves become more experienced, Thai wine is certain to grow both in terms of production and crucially in its reputation for consistent quality.